We planned to do our letter L unit around Valentine's Day, and we focused on the theme of "love." You don't have to do this unit at Valentine's time, though. One of the books we read was Love, Ruby Valentine, a cute little story about a girl who gets so excited to prepare for Valentine's Day and then accidentally sleeps through Valentine's Day. At first she is upset that she missed Valentine's Day, but then she realizes that she can (and should) express love any time of year. So it may be even more fun to do this unit at a different time than Valentine's Day, so you can feel that same excitement that Ruby feels at the end of the book! We traced the shape of the letter L using conversation hearts. We used the large tracing letters from Confessions of a Homeschooler. In addition, I bought a tracing font here for one dollar, and I use it a lot to create my own personalized word tracing sheets for my kids. For this unit, my kids each listed off some things that they loved (i.e., trains, monkey, Mommy, etc.) and I created personalized tracing pages for each of them with words to trace of the things/people they loved along with a picture next to each word. We also used our pocket chart to spell out the word "love" and we reinforced the sound of the letter "L" in all of our day-to-day activities. In addition to the Ruby Valentine book, here are a few other books we read as we talked about love. I really like this sweet story of how a lonely man completely changes because of one Valentine's package. In this book one little girl secretly leaves a bowl of berries on her neighbor's porch and starts a chain reaction of good deeds around the world. We enjoyed reading this book and talking about how sometimes the smallest acts of service can make the biggest difference--like just playing "peek-a-boo" with a grumpy baby in an airport. We love this board book about a bunny and his dad expressing their love. We also act out parts of the book as we read it--stretching our arms out, hopping up and down, and so forth. In this cute Valentine book, a little boy expresses his love for the people and animals in his life. The simple rhyming text made it easy to read to my kids. I also read a book that I made myself for my oldest son a few years back--"Who Loves You?" I created pages with pictures of him and various friends and family. On each page, I put a picture of him with a friend or family and wrote the caption "Mommy loves you," or "Grandma loves you," etc. My kids love looking at photo books with their own pictures. I have also made other books starring them--such as an ABC Book, a colors book, and an opposites book. I printed off a "valentine tree" math mat from this website. I laminated the mat and used a dry erase marker to write different numbers in the counting box in the lower corner. Then my kids took turns putting the matching number of hearts on the tree. We also practiced counting as we played with our sensory bin. I numbered an ice-cube tray and had my two-year-old count some of our valentine coins (from the dollar store) as he dropped them into individual slots. I also had my four-year-old do some "graphing" with conversation hearts, using a printable from this Valentine pack. Since the heart is a symbol of love, we learned a little bit about the actual human heart as part of our "L is for Love" unit. We have some great books about the body from which we read the pages about the heart. Then we listened to each other's heartbeats using the stethoscope I bought for our doctor pretend play set. If you wanted to further experiment, you could try listening or counting heart rates before and after running or jumping or dancing to see how the heart rate changes. We made heart-shaped sugar cookies and delivered them to some of our neighbors whom we felt needed a little extra love. Here's another list of some great acts of kindness you could do with your kids. One that I have done with my kids is collecting grocery carts at the store. So many people leave their carts here and there when they are in a hurry, so it's a good, simple and free little service project to help out both the drivers of cars and the employees of the store by returning the carts to their spots. Just be careful to keep your kids close and safe while collecting the carts! We had fun taking turns pretending to be mailmen. I printed out pictures of envelopes onto several different colors of cardstock and laminated them. Then, I let the kids use dry erase markers to draw pictures or write "love notes" on the back of the envelopes. We used an old re-usable shopping bag as our "mailbag." I created a mailbox from a small cardboard box (that had held some of our canned food) and construction paper. All week, we worked on making Valentines for our friends and family that we love. I just set up a Valentine-making station with scissors, glue, stickers, glitter, and markers for the kids to create Valentines (And even if it's not Valentine's Day, you can still set up a station for making love letters and notes for friends and family). I taught my 4-year-old how to fold a paper and cut out the shape of a heart. He loved opening up the folded paper each time and seeing how his cuts had transformed the paper into a symmetrical heart. My 2-year-old was obsessed with the stickers and glitter and I had to keep reminding him to put the glue down first so that the glitter would stick. But eventually he figured it out, and he created some fun, sparkly Valentines. Even my one-year-old sort of created Valentines. She took a marker to a piece of paper, and I cut out her pages of scribbles into the shapes of hearts for members of the family. 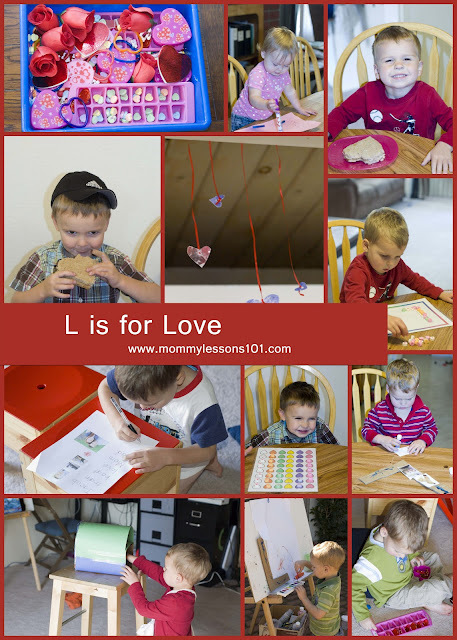 We also did letter "L" love collages, inspired by this idea from No Time for Flashcards. Rather than taping paper to our cut-out L, I had the kids go outside and paint cardboard L's with regular paints and finger paints. Then, after the paint dried, they glued pictures of thing/people they loved onto the letter L's. They loved painting, and so even though the paint was almost completely covered up when we glued on the pictures, the process was so much fun that it was well worth it. Then, we created melted crayon shaving hearts. First, the kids peeled the paper off of a few different crayons. They loved doing this. They are always excited when they get to do something that is normally not allowed. Then, they each took a pencil sharpener and shaved off some crayon shavings onto a sheet of waxed paper (I had to help my two-year-old a lot with this part). Finally, we spread out the crayon shavings into a thin layer--remember they will spread out as they melt, so if you want to keep the final product translucent, keep the crayon-shaving layer thin. Then, I put another piece of waxed paper on top and layered the crayon-shaving/waxed paper sandwich between pieces of scratch paper and ironed it until the crayon shavings melted. We gave the melted waxed paper and crayons a few minutes to cool off and then we cut out heart shapes, taped ribbon to these hearts, and then hung the hearts from the ceiling of the boys' room. I had originally intended to put it in the window as a pretty sun-catcher, but they wanted it in their room, so that's what we did. For a love-themed sensory bin, I just went to our local dollar store and browsed the Valentine aisle for small red, pink, and heart-shaped items: fake roses, little heart-shaped boxes, bracelets, notepads, and red coins. I also got some pink ice cube trays, along with conversation hearts for my kids to sort and count. My kids always love sensory bins, and they were excited when I pulled this out. They all loved putting things in and out of different containers, lining things up in neat rows, sorting by color, and so forth. For the most part, I let them just freely play and explore while I supervised. But I did guide them to some activities--such as using tongs to try to pick up conversation hearts and put them in the ice cube trays and scribbling little "love notes" on the heart-shaped notepads. Many of the conversation hearts that we used as manipulatives made their way into our tummies. But for a healthier snack time, I also cut sandwiches and cucumbers into the shapes of hearts. My kids loved their heart-shaped food. We also made heart-shaped sugar cookies (and, as I mentioned above, we delivered some of these to our neighbors to spread a little love). My all-time favorite recipe for sugar cookies is found here. It is not healthy at all, but the cookies are soft and delicious! We played the number matching game from this Valentine Tot Pack. We practiced our numbers and had fun at the same time. Bonus! To make it easier for my kids to match, I mounted all of the numbers on pink construction paper and all of the corresponding items on purple construction paper. Then, we turned the cards face down and I had them take turns flipping over one pink and one purple card to see if they could find matches. We also played mailman bingo and sorted stamps by color using this cute mailman tot pack. For music time, we sang traditional kids' songs such as "A Bicycle Built for Two" as well as some of songs from our church Children's Songbook with the theme of love such as "We are a Happy Family," and "Jesus Said Love Everyone." We also listened to the jazz song "L-O-V-E." I always love to sneak in some of my favorite grown-up songs when I can. The kids like to dance around to almost any kind of music. And for more related activities, go check out my "L is for Love" board on Pinterest!